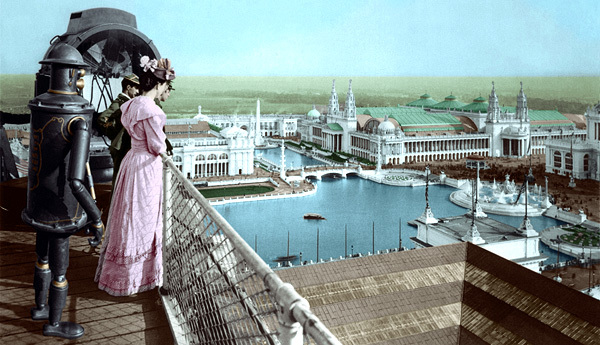 at the Machinery Hall of the World's Columbian Exposition in Chicago, Illinois. Machinery Hall can be seen at upper right. Machinery Hall at sunset, one of the 14 Great Buildings that housed most of the fair’s 65,000 exhibits. Artfully landscaped canals, lagoons, and causeways connected these classically styled white edifices into an idealized, orderly White City. Electric boats plied the waters, they ran on Edward Fullerton's fuel cells, the same technology that powered Boilerplate. Inside Machinery Hall, Archie’s exhibit was dwarfed by seemingly endless rows of state-of-the-art mechanical devices and tools, with special attractions such as Eli Whitney’s cotton gin, the world’s largest conveyor belt, and a cutting-edge power plant that generated electricity for the whole fair. 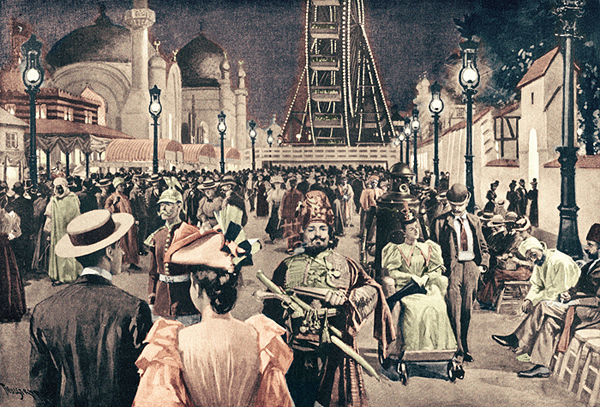 At night the fairgrounds were illuminated by electric lights, thanks to an early alternating-current system developed by Archie’s friend Nikola Tesla. The world had never seen anything like it. Boilerplate pushes Lily Campion in a wheeled touring chair on the fair's Midway Plaisance. Archie is walking next to them. Ironically, the visual cacophony of this unique setting gave Boilerplate some respite from curiosity seekers. In retrospect, it’s hard to understand how such an advanced, groundbreaking invention as Boilerplate could’ve gotten lost in the shuffle. But at the time, there were so many special events and celebrities, so many novelties and exotic cultures being introduced to a dazzled public, that a man-sized automaton seemed only mildly remarkable. There was too much competition. The fair showcased “every device that genius could suggest and money supply,” in the words of Bertha Honoré Palmer, who headed the Board of Lady Managers. Exhibitors from around the globe brought with them all manner of inventions, materials, goods, arts, foodstuffs, machinery, ideas, publications, crafts, games, and customs. Back then, it was the closest thing to a collective, interactive knowledge base like the Internetbut in physical form, all in one place, and temporary. All contents copyright 2000, 2010 Paul Guinan. Boilerplate, Archibald Campion, and all related marks and indicia are trademarks of Paul Guinan.